Last night we celebrated the most important event of the year for our foundation. 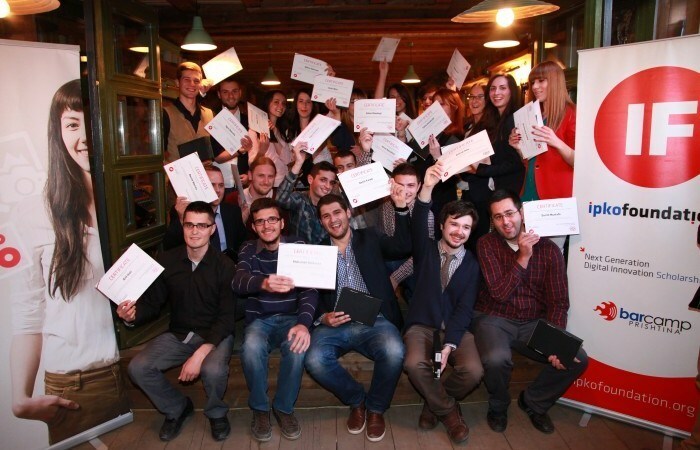 In a friendly atmosphere at “Taverna Dardha” among friends, partners, students, and families we solemnly awarded 22 scholarships for the next generation of scholars for the academic year 2013-2014. Board member of IPKO Foundation Kushtrim Xhakli, welcomed all guests, jury members, representatives from Ministry of Education, and representatives from different universities and wished the best luck for all the scholars. In his address Xhakli pointed out the difficulties that reviewer board faced while selecting this round winners. He said that being in the review board and having to select the best applications was a pretty tough task, adding that they had to choose the best from best. Beside certificates, we gifted the youngest of our community with Kindles. Following the formal ceremony, a dinner was served for all the guests where people had chance to do what IPKO Foundation’s events offer exclusively- networking. For the fifth time, our foundation is allocating over 30,000 Euros to support development of the next generation of youth with digital vision for Kosovo. Since 2009 IF has awarded over 280,000 Euros in scholarships. Have a look at the gallery from the last night event.